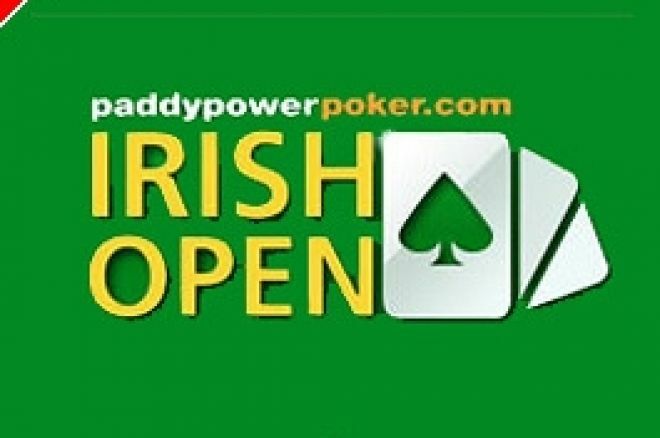 The &euro;1,000,000 Paddy Power Poker Irish Open got underway yesterday with a sold out field of 339 runners. Stars from both the felt and screen descended on Jurys Ballsbridge Hotel in Dublin. As we head into day two, though, local boy Eamon 'Crazy Daisy' O'Grady heads the chip count with 82 other players are biting at his heels. Friend of UK Poker News, Roy 'The Boy' Brindley, is nicely positioned in 3rd place. Whilst former footballing legend Tony Cascarino is surely in with a great chance, as he sits just outside of the top ten. Former Eastenders actor Michael Greco's fortune was not so good. The star of stage and screen busted out early on day one. The Irish Open is proving to be one of the most successful poker tournaments in Europe to date. The seats for the event were sold out days in advance with Irish bookmaking giants Paddy Power guaranteeing a &euro;1,000,000 prize pool. A &euro;350,000 first place prize awaits the winner of this years event. Eclipsing the &euro;147,000 won by last years victor "Burnley" John Falconer. Sky Sports were quick to realise just how big this event would be and snapped up the rights to film the final table. The last six players fight it out LIVE on Sky Sports 2 from 9.30pm on Monday 17th. Day two is sure to be a fiery affair as players try their uppermost to reach the televised final table. UK Poker News will keep readers right up to date with the proceedings.